Most flowers are actinomorphic ("star shaped", "radial"), meaning they can be divided into 3 or more identical sectors which are related to each other by rotation about the centre of the flower. Typically, each sector might contain one tepal or one petal and one sepal and so on. It may or may not be possible to divide the flower into symmetrical halves by the same number of longitudinal planes passing through the axis: Oleander is an example of a flower without such mirror planes. Actinomorphic flowers are also called radially symmetrical or regular flowers. Other examples of actinomorphic flowers are the lily (Lilium, Liliaceae) and the buttercup (Ranunculus, Ranunculaceae). Zygomorphic ("yoke shaped", "bilateral" – from the Greek ζυγόν, zygon, yoke, and μορφή, morphe, shape) flowers can be divided by only a single plane into two mirror-image halves, much like a yoke or a person's face. 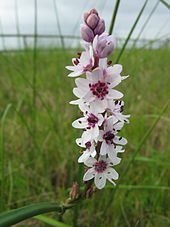 Examples are orchids and the flowers of most members of the Lamiales (e.g., Scrophulariaceae and Gesneriaceae). Some authors prefer the term monosymmetry or bilateral symmetry. A few plant species have flowers lacking any symmetry, and therefore having a "handedness". Examples: Valeriana officinalis and Canna indica. Peloria or a peloric flower is the aberration in which a plant that normally produces zygomorphic flowers produces actinomorphic flowers instead. This aberration can be developmental, or it can have a genetic basis: the CYCLOIDEA gene controls floral symmetry. Peloric Antirrhinum plants have been produced by knocking out this gene. 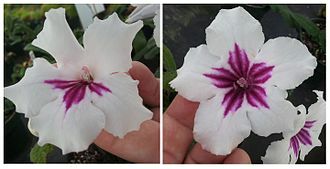 Many modern cultivars of Sinningia speciosa ("gloxinia") have been bred to have peloric flowers as they are larger and showier than the normally zygomorphic flowers of this species. ^ Keeble, Frederick; Pellew, C; Jones, WN (1910). "The Inheritance of Peloria and Flower-Colour in Foxgloves (Digitalis purpurea)". New Phytologist. 9. doi:10.1111/j.1469-8137.1910.tb05554.x. JSTOR 2427515. Endress, P. K. (February 2001). "Evolution of floral symmetry". Curr. Opin. Plant Biol. 4 (1): 86–91. doi:10.1016/S1369-5266(00)00140-0. PMID 11163173. Neal P. R.; Dafni A.; Giurfa M. (1998). "Floral symmetry and its role in plant-pollinator systems: terminology, distribution, and hypotheses". Annu Rev Ecol Syst. 29: 345–373. doi:10.1146/annurev.ecolsys.29.1.345. JSTOR 221712. This page was last edited on 21 May 2018, at 06:14 (UTC).